Since we got back from Peru it feels like I have found my sewing groove again. I’ve been tackling projects well out of my comfort zone and learning lots of new skills. Whilst this is fun it can be a bit of a brain melt so enter the palate cleanser. Coined by my dear friend Kirsty, this is a nice and easy project that comes together quickly and guarantees you success – just what is needed when you are stuck on Step 45 of a complex project. So here it is! Welcome to my super cheerful, quick and dirty palate cleanser skirt. 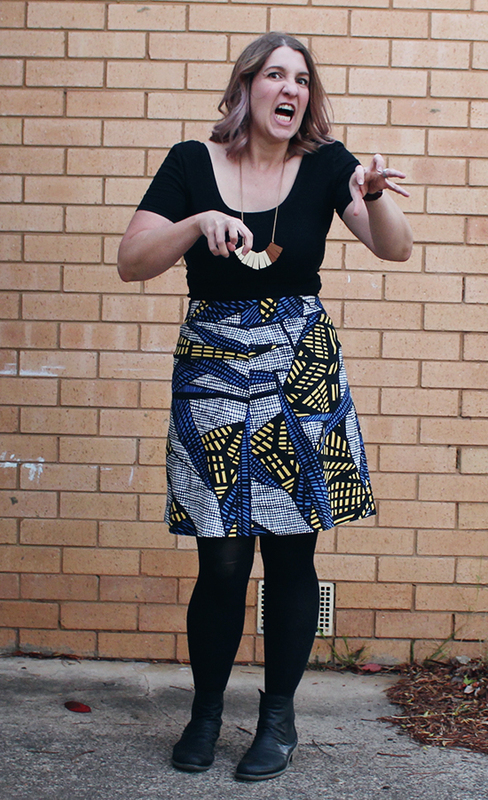 For those unfamiliar, this is the Ginger Skirt by Colette Patterns. This lovely workhorse is a simple A-line featuring a high waistband and a central front seam – no darts here! It’s one of my oldest patterns and there have been a few iterations sewn up over the years. This skirt is Version C (straight waistband) but the fabric is cut on the grain rather than the bias. From go to whoa this took about 90 minutes to knock together – or a disc of Parks & Rec if my real units of time measurement are used. I am absolutely in love with this fabric – a lovely and light cotton sateen from Tessuti Fabrics. This was scored late last year on a ninja visit to Melbourne where I managed to squeeze in a lunch break fabric shopping trip. It turns out twenty minutes is more than enough time to buy three pieces of fabulous fabric AND grab a cupcake for lunch. Who knew?! 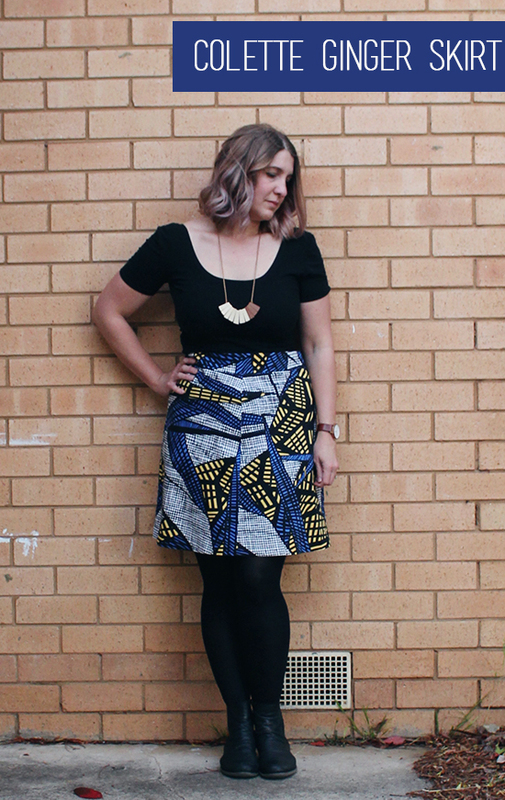 Construction wise, this was a super simple skirt to make. The lack of darts makes for crazy fast construction and truthfully the biggest challenge was inserting the zip because I was tired. It’s not sitting as nicely as I like but you can’t win them all. One point of interest – as there are no darts the front seam line is curved to provide shaping for the skirt. This is not noticeable in plain fabric but if you are using a fabric with a repeat it’s worth bearing in mind. Or do as I do and get a crazy print and no one will even notice the seam! The simple design. It’s a perfect showcase for that crazy fabric that you just can’t say no to. So yes, you can justify grabbing that poplin featuring rainbow unicorns battling robot dinosaurs! Easy construction. The Ginger is a total comfort sew for me (odd as that sounds) and is a great pattern for beginners. The fabric. 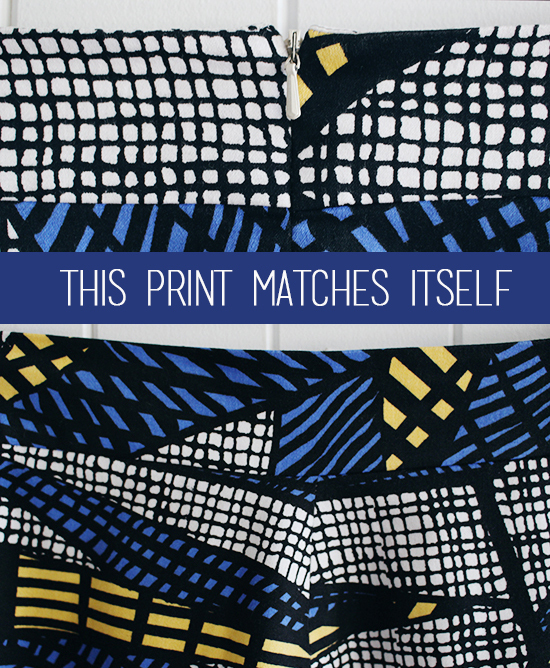 This is one of my most noticed and complimented on makes ever – everyone loves this print! Bring the waist in a little. I had to size up from the last few times I’ve made this and the waist is just a little loose. No one deserves a saggy skirt! Insert the zip properly. It is not sitting flush at the top of the waistband. Oops. Tweak the waistband insertion. I totally forgot to understitch the waistband lining until it was almost too late. As a result it is not fully understitched. On the plus side, the only one who notices is me! I love you & your ginger skirt! Thanks, Anna 😀 IT’s nice to be back in the sewing groove and this fabric helps make it fun! Looks triffic! Love a palate cleanser! A palate cleanser AND a whoo hoo make! Totally winning, lady. Can I come over and have you rub some of that sewjo on me? Also that fabric is rad. I actually thought it was African wax print until you told me it was sateen. WHUT>>>>? Hugging the puppies totally gives you an extra +5 sewjo points – you should come on over! How crazy is the fabric? I thought the same until I felt it. And we all know my love of sateen – so dreamy! What a great palate cleanser, even I feel refreshed just looking at the photos! Thanks, Helene! The fabric is so much fun it made me want to sew! Thanks, Helen! Feeling sharp down this end! Ohh, the best thumbs type of all! Thanks, Colette!! Is your tshirt a Nettie? Loving the double scoop! I always have trouble finding something to wear with skirts. Well spotted, Sylvie! I love the double scoop too – it makes me feel like a ballerina! Sensational print. You’ve also reminded me that I bought the Nettie pattern two years ago and have never made it.